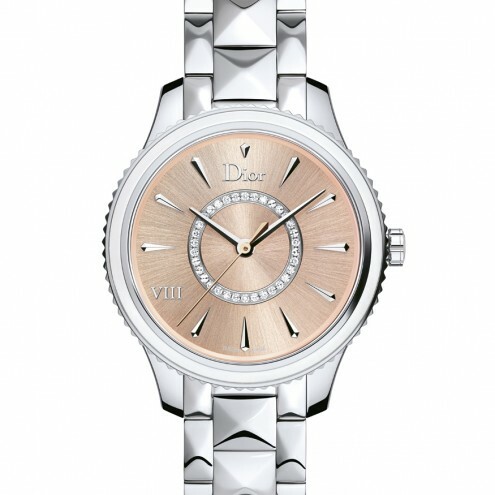 During our visit to this year’s Baselworld, one of the most important trade shows for watches and jewelry, we had to stop by Dior’s lush stand. It was simply impossible to oversee. This timeless and feminine timepiece comes in two sizes, 25mm and 32mm both in quartz, and embodies the Haute Couture’s emblematic codes: an elegant silhouette, architectural line, the harmonious combination of Dior colors and watchmaking materials such as the luminous grey. 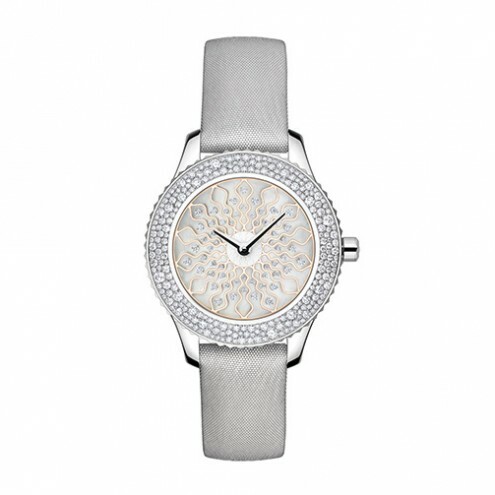 The 32mm Dior VIII Montaigne timepiece with quartz elements represents the modern Dior ready-to-wear spirit. 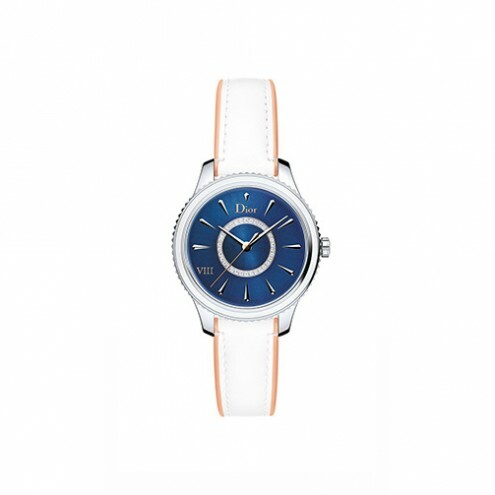 The shimmering dial, tinted in dark blue lacquer, is an eye-catcher and a perfect contrast to the white calfskin strap lined in peach – colored rubber. 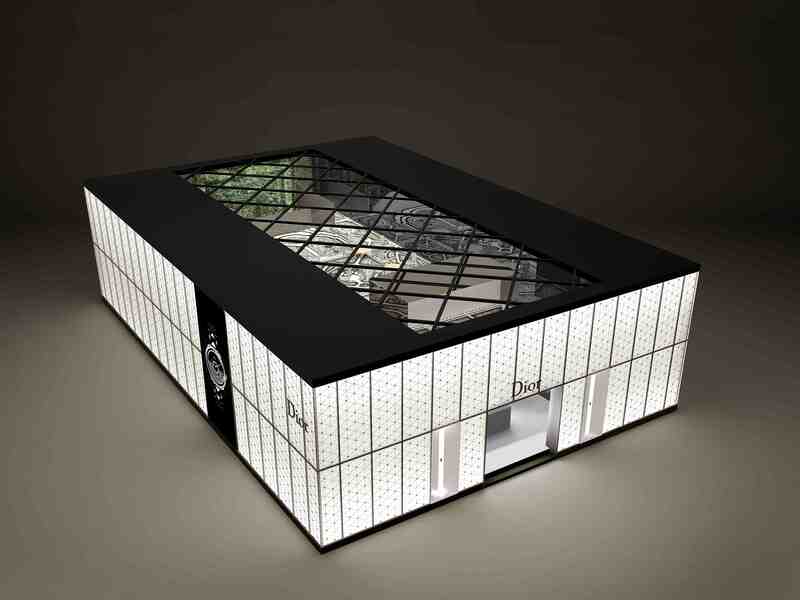 VIII or eight is a lucky number; the 8th of October 1946 is the date Christian Dior’s Couture House was established. Consequently, “En Huit” (In Eight) was the name of the first collection. 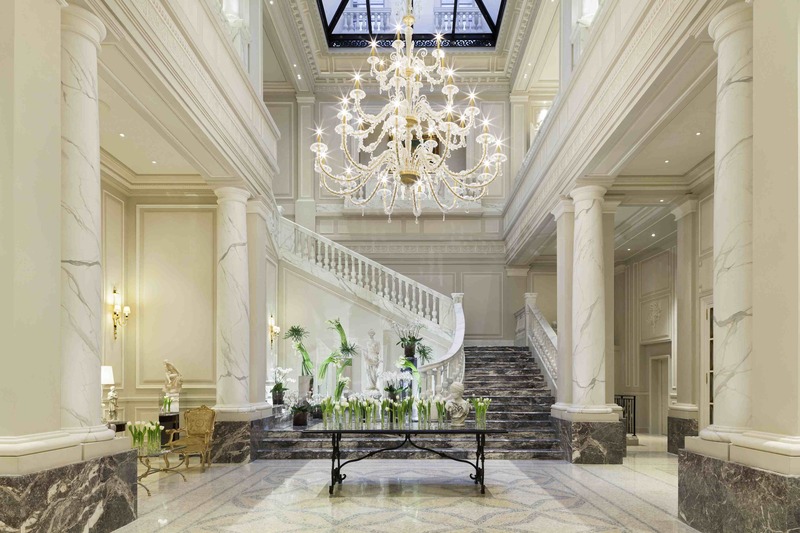 Furthermore Dior’s main building is set in the VIIIth arrondissement of Paris. 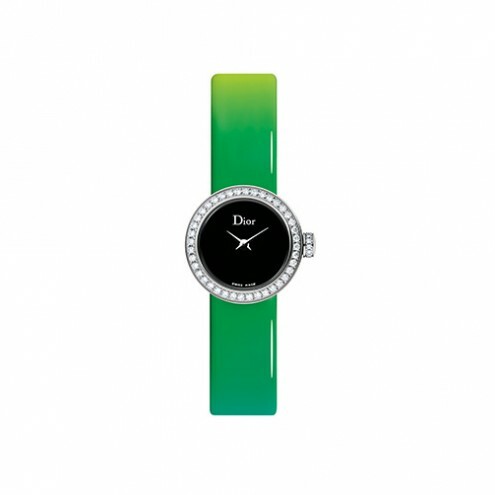 This year’s model is adorned with a new color combination: deep green for the dial, bright pink of the oscillating weight with a combination of white mother-of-pearl pleating. There are two possibilities for the strap: either with a steel bracelet or with a shiny blue alligator strap. 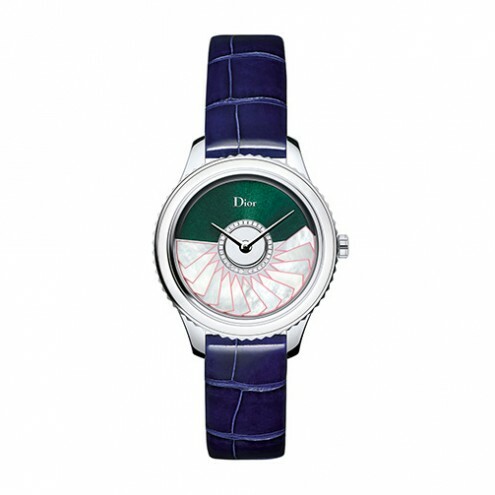 This model comes in size 36mm with an automatic movement and resembles the swirl of of a sun-pleated dress. 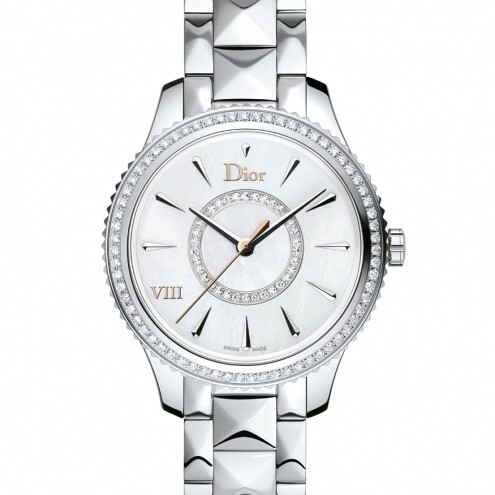 The Dior VIII Grand Bal “Envol” makes a strong graphic statement. 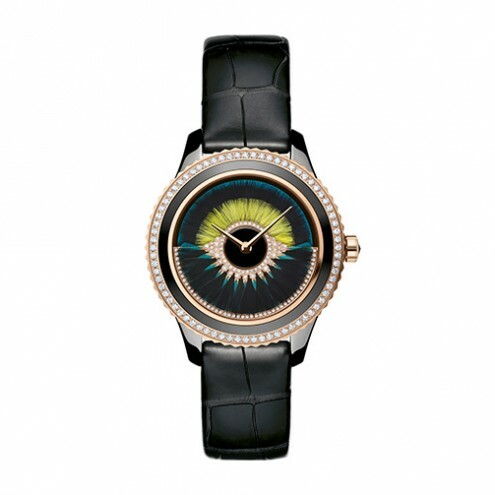 The dial is covered with scarab beetle elytra marquetry, the oscillating weight is presented like a modern artwork: a combination of mother-of-pearl, gold and baguette-cut diamonds designed in a spiral motif. 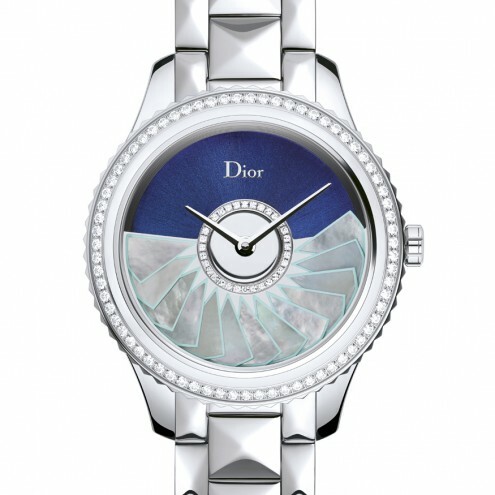 The Dior Grand Soir collection pays tribute to Haute Couture and unveils five, new, one-of-a-kind pieces numbered from 39 to 43. 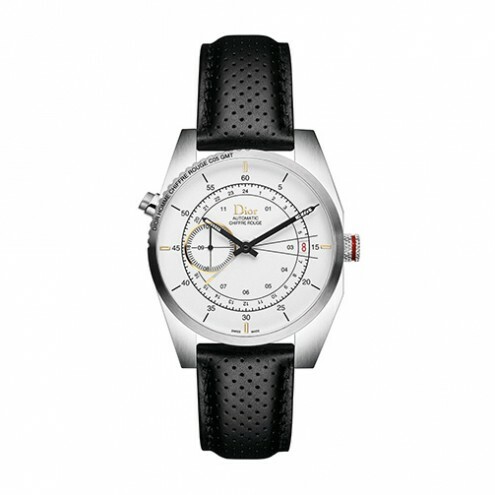 The timepieces are equipped with an Elite movement by Zenith manufacture comprising of gold oscillating weight. 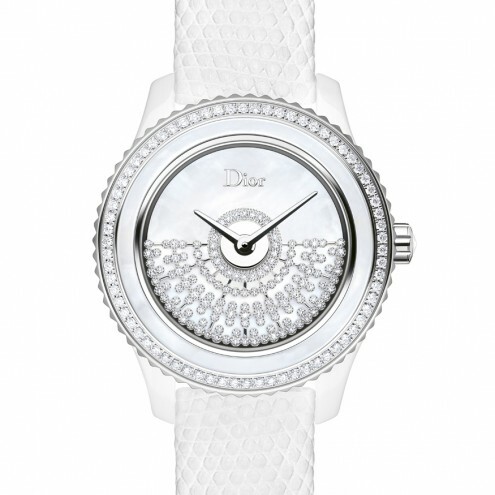 The 19 mm La Mini D De Dior with a quartz movement was designed by Victoire de Castellane, Dior’s creative director for fine jewelry since 1998. 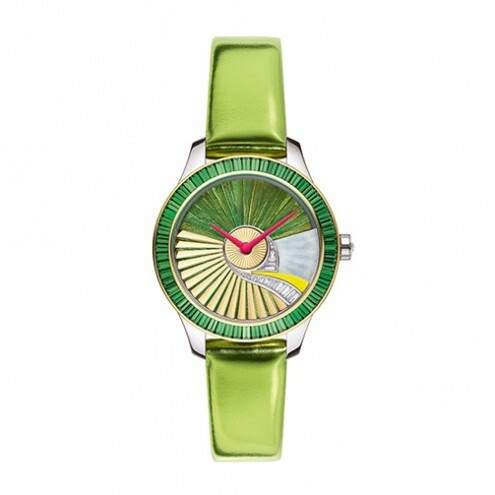 These two new versions are characterized for their rainbow colored patent leather straps. 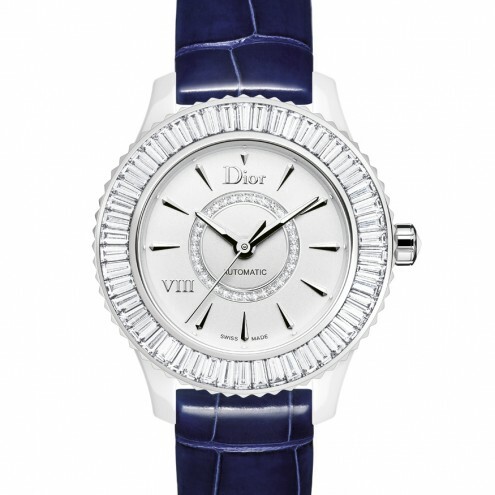 The 32mm Dior VIII Montaigne timepiece with quartz movement embodies the modern Dior ready-to-wear spirit. 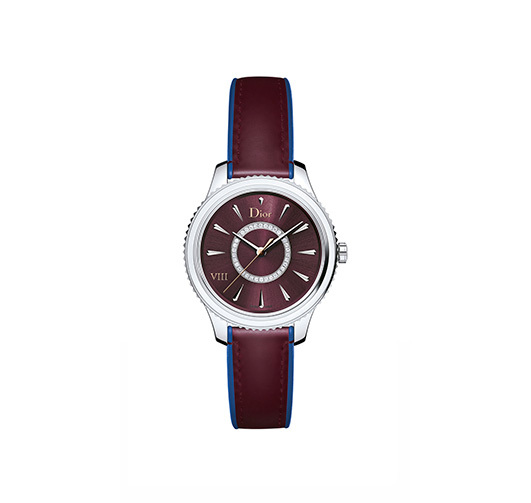 The shimmering dial tinted in plum-coloured lacquer has the same color as the calfskin strap lined in blue rubber. This is a new model of the Grand Bal collections. 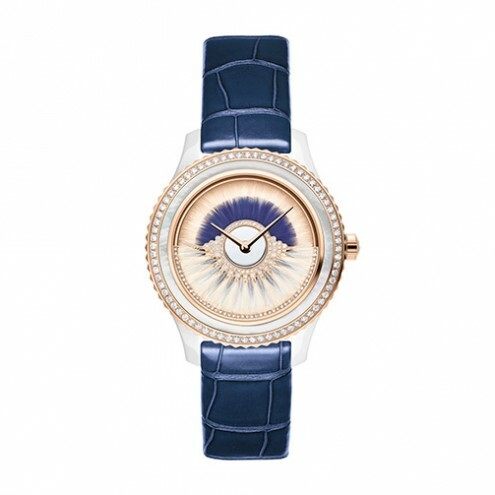 The 38 mm timepiece combines the know-how of the Haute Couture art of feather-making with watchmaking technology. 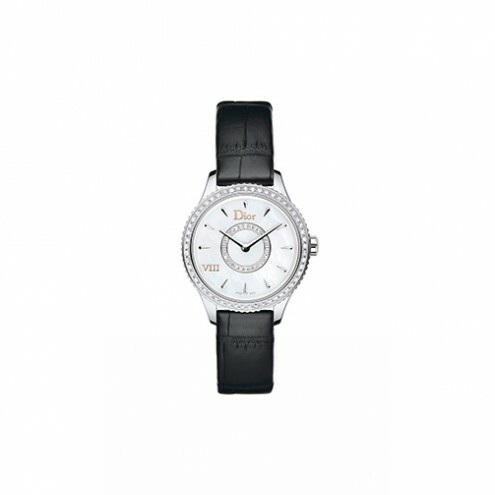 It is equipped with an automatic movement and comes in ink gold and black or white ceramic versions. 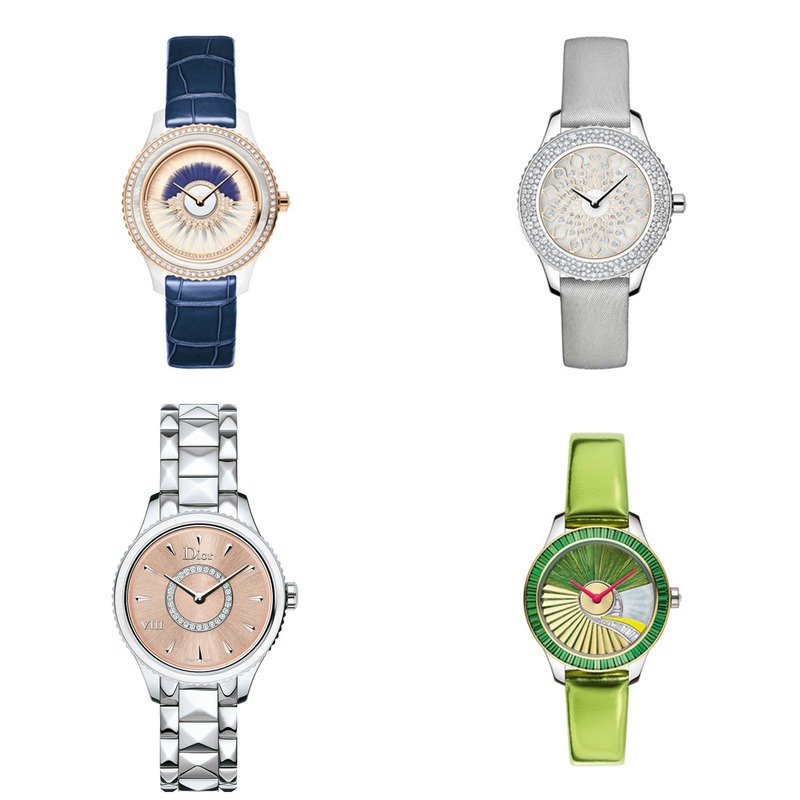 This timepiece consists of delicate and feminine feathers enhanced by a wide range of colors. The oscillating weight is placed on top of the dial reproducing the swirl of a ball gown. 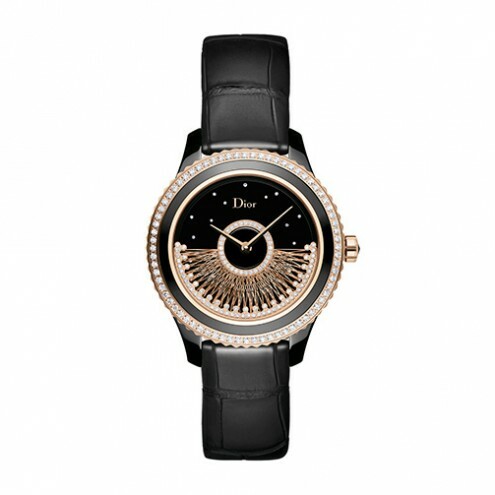 This Dior VIII Grand Bal timepiece is a fusion between traditional Haute Couture know-how and watchmaking technology. 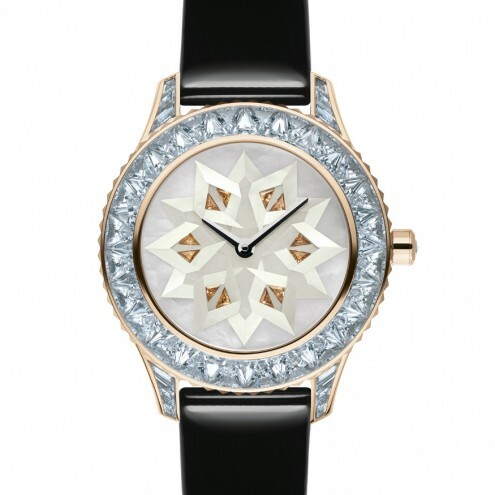 The oscillating weight is decorated with diamonds and gold and is equipped with an automatic movement. Thank you for sharing this post! Love your blog btw!